This book, first published in 1990, considers the uneasy relationship between Russia and Soviet Central Asia. 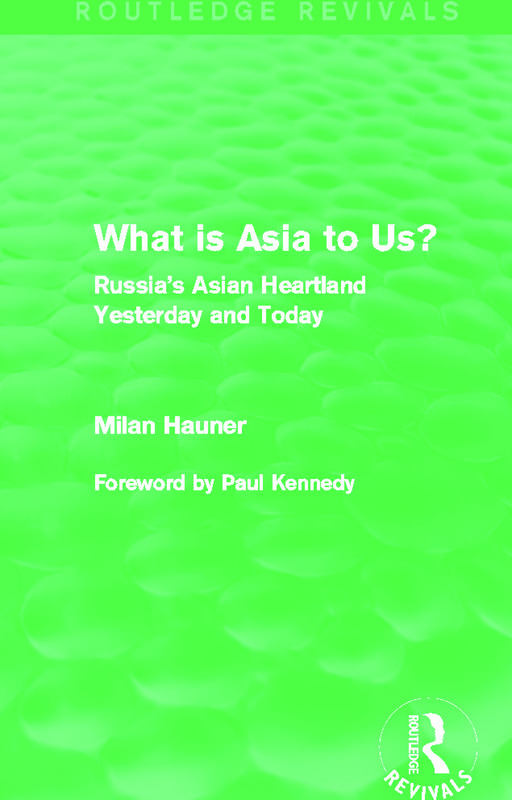 Chapters examine both the significance of Asia to the Russian mind and the place that Asia has occupied in Russian geopolitical thinking in the last hundred years, showing that outbreaks of violence are simply a manifestation of a long-standing tension. This is a remarkable and comprehensive study, which will be of great value to those concerned with the history and future of Central Asia and Siberia. List of Figures and Tables; Acknowledgements; Foreword by Paul M. Kennedy; 1. Introduction: What is Asia to Us? Part I: Asia and the Russians 2. Russian Ideology and Asia 3. Historians and Geographers 4. Easterners and Eurasianists; Part II: Russia’s Central Asian Heartland 5. Russia’s Drive South; Part III: The Heartland Debate 6. Mackinder’s Concept of Heartland Russia in 1904 7. Mackinder and the Russian Quest for a New Center of Gravity 8. German Geopolitik, Haushofer, and the Russians 9. The Heartland Revisited: Geopolitics in Soviet Perspective 10. Geopolitics and the Soviet Eurasian Empire Today 11. In Place of Conclusions: What is Asia to Gorbachev’s Russia?